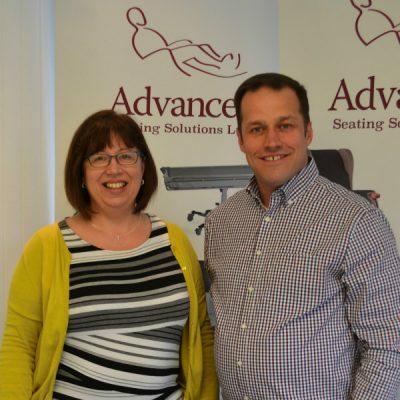 With over 40 years of experience between them our Directors, Martin and Kate Coles, head up the Leadership team at Advanced Seating Solutions Ltd.
Martin is an expert in the field of product selection, assessment and training and is an experienced and highly knowledgeable Product Advisor, with over 18 years’ working in this field. Kate is an Occupational Therapist with over 25 years’ experience. She has worked with adults and children managing a range of complex and multiple disabilities and is the guiding force behind our Therapy Services. Initially, as a supplier of Specialist Seating, we soon realised that our customers wanted more! We listened to their feedback and, as a result, we now offer a far wider range of solutions. Underpinned by our expert knowledge, experience and research we provide a comprehensive range of high quality, specialist equipment, an environmental design service, Therapy programmes and bespoke Carer/Professional training. We supply not only to Customers looking to purchase their own equipment or adapt their home in some way, but are also Registered Suppliers to NHS services, Adult Services, Hospices, Nursing/Residential Care Homes and Charities. We offer Free, on site equipment assessments and site surveys and a full range of after sales services. This will include, where appropriate: Express Delivery, Equipment Set-up, Training and Service Packages. As a truly “One Stop Shop”, we constantly strive to keep YOU at the Centre of the assessment process and We are proud that we offer an unrivalled, unique and solutions focused service. Are your staff fully trained to deliver the appropriate care? Contact us to discuss our Back on Track Training Solutions. Free Set up and Training on certain specialist equipment, service and maintenance contracts Contact us for more details on availability and cost.